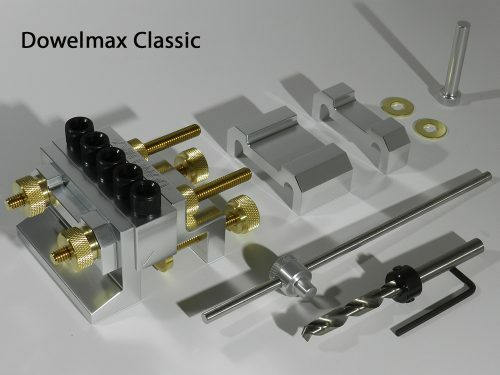 This picture shows how the Dowelmax is designed to allow for equidistant spacing of two 3/8 inch dowels in a standard 3/4″ x 1-1/2″ work piece for building rigid 1×2 furniture frames. An example of an application of this multiple dowel wood joint configuration is the diy display cabinet frame shown on the Dowelmax furniture page. 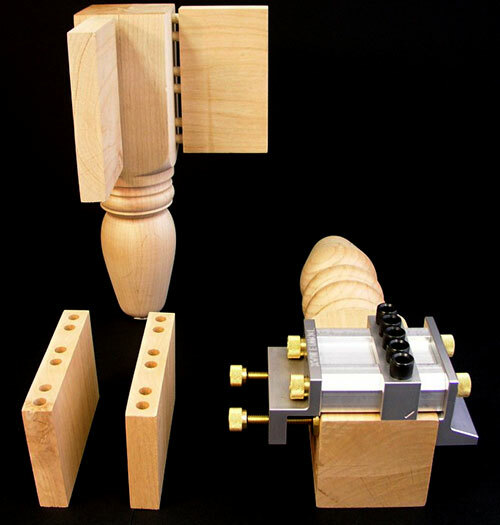 This picture shows a 1×6 to 2×2 multiple dowel wood joint configuration used for building furniture like a do it yourself end table, using the 3/8 inch spacer to create a 3/8 inch offset and the index pin to extend the dowels along the wood joint work piece. An example of an application of this multiple dowel wood joint configuration is the end table frame shown on the Dowelmax furniture page. 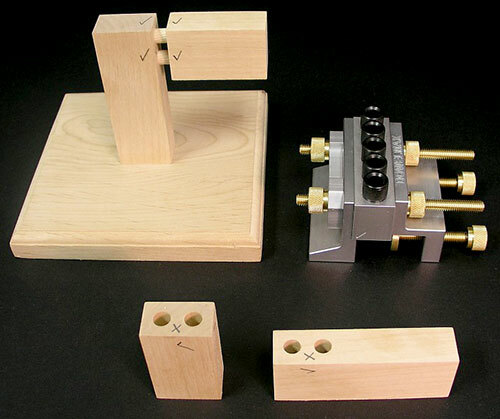 This picture shows a 2-1/4×2 to 2×2 multiple dowel woodworking joint configuration using the 3/8 and 3/4 inch spacers to create accurate, snug and strong double or triple row multiple dowel joints used for building furniture where increased wood joinery strength or load distribution is required. An example of an application for this multiple dowel wood joint configuration is a do it yourself chair. 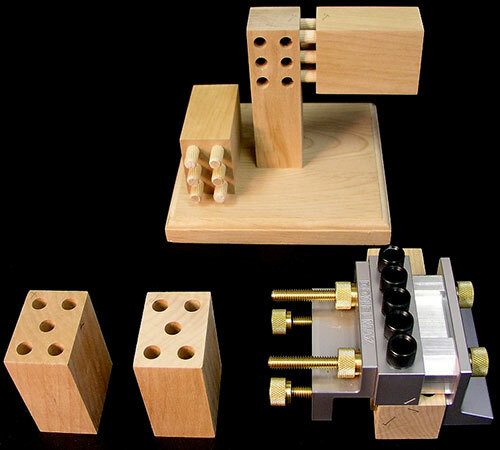 This picture shows a 1×6 to 4×4 multiple dowel woodworking joint configuration which is ideal for building do it yourself furniture requiring the thick 4×4 leg, for example coffee tables, dining tables and beds. 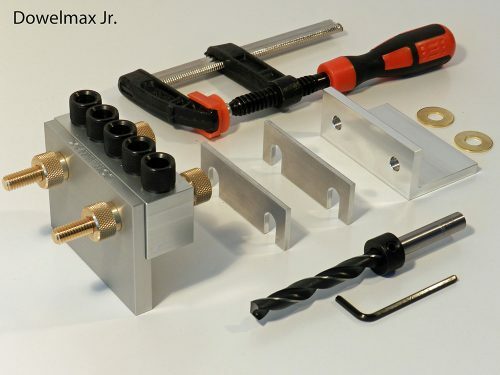 The 3/4 inch spacer is used to create a 3/4 inch offset and the 1-5/8 inch spacer is used to expand the Dowelmax to accommodate the 4×4 wood joinery work piece. An example of an application of this multiple dowel wood joint configuration is the 4×4 leg used for the coffee table shown on the Dowelmax furniture page. 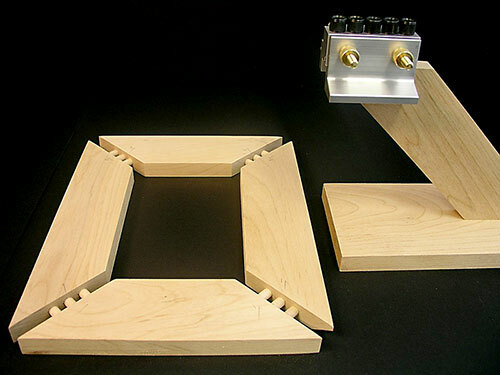 This picture shows a 1×4 to 1×4 multiple dowel woodworking miter joint configuration used for building furniture like a coffee table top or dining table top with glass or wood inset or for building picture frames. The edge of the Dowelmax reference block is set flush with the outer point of the mitered corner as shown on the right. Wood joinery surfaces can be made flush within .002 inches. An example of an application of this multiple dowel wood joint configuration is the coffee table top shown on the Dowelmax furniture page. This picture shows an edge to edge multiple dowel wood joint configuration used for building a do it yourself solid wood table top for furniture, for example like a dining table or book case. 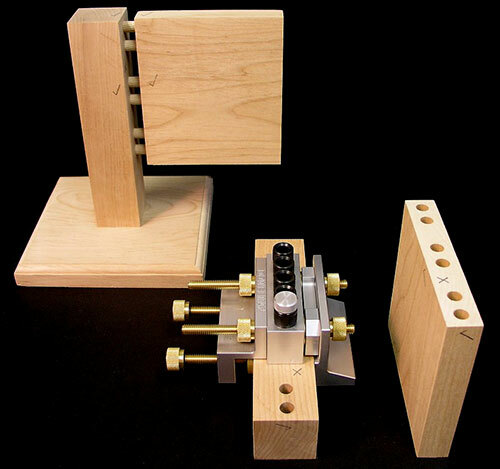 The distance gauge can be used to accurately align dowels on longer work pieces. 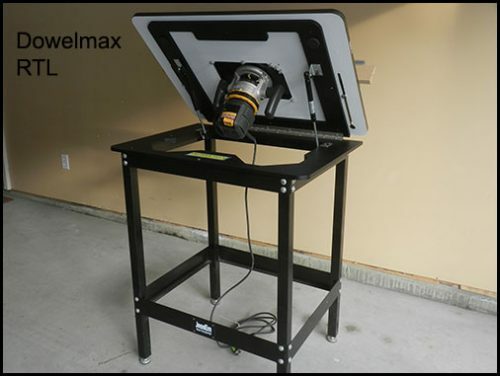 The Dowelmax shown in the example is shimmed with two 1/8 inch shim washers for use on 1 inch thick wood joinery. 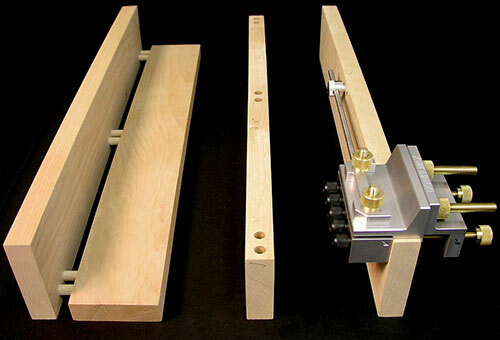 This picture shows an edge to face multiple dowel woodworking joint configuration which is ideal for building a do it yourself cabinet carcass. The Dowelmax clamp bracket is relocated to the underside of the reference bracket to change to the face wood joint configuration to create the face joint as shown. The Dowelmax shown in the example is shimmed with two 1/16 inch shim washers for use on 7/8 inch thick wood joinery. 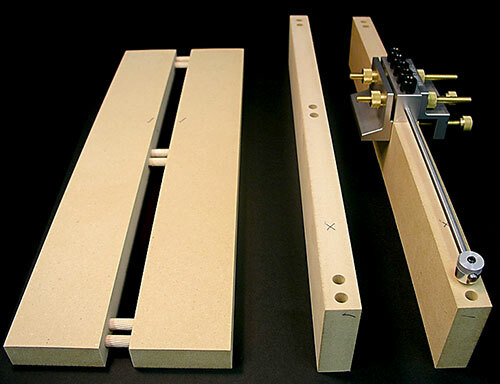 An example of an application of this multiple dowel wood joint configuration is the diy face frame cabinet carcass shown on the Dowelmax furniture page. This picture shows a 2×4 to 2×4 T-type multiple dowel wood joint configuration used for building large furniture projects that require a cross member wood joint application for reinforcement, for example building an office desk with Dowelmax. A variation of the T-type wood joint can be used for a diy cabinet shelf as shown in the “Supplementary Cabinet Shelf Instructions” link below Example 8. 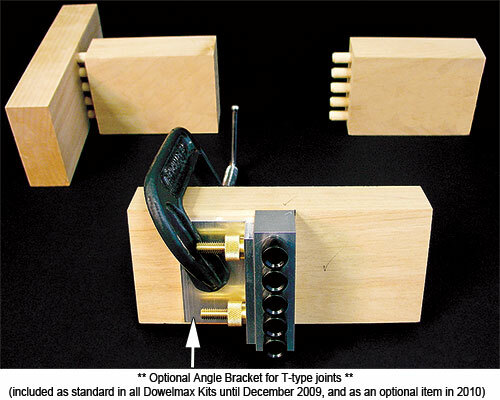 An example of an application of this wood joint configuration is the cross member used to reinforce the coffee table frame shown on the Dowelmax furniture page.